When I learned North Table Mountain, in Golden Colorado, had trails leading to its top, I became somewhat obsessed with the desire to hike up it one day to see the views from the top. We drove by it often, on our way to visit family, and it looked like a challenge I wanted to try. North Table Mountain is actually a mesa, formed about 60 million years ago by lava flows. 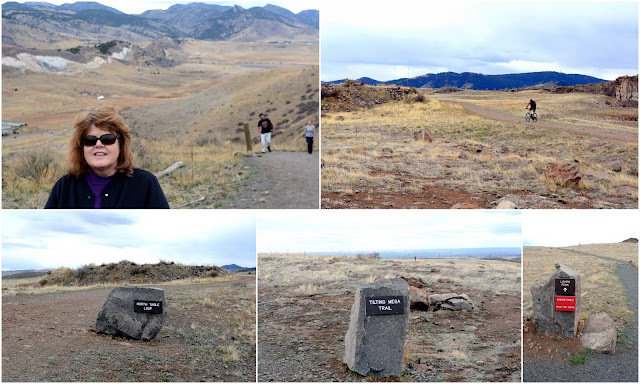 At the 6,555 feet (1,998 m) summit of the mesa is North Table Mountain Park. The park is rimmed with fifteen miles of trails and is home to prairie dogs, deer, golden eagles and red tailed hawks that nest in the cliffs, and rattlesnakes. My husband and I parked our car in a lot at the base of the west side of the mesa, on State Highway 93, just north of Pine Ridge Road. The trail up is a wide gravel path and is about a mile long. It is hard to judge from my photos, but it is a very steep trail--almost straight up in climb. I had to take it slow and rest often to slow my pounding heart, as the 400 foot elevation ascent was a challenge for me, but those who were younger, and obviously in better shape, were able to run, bike and climb without resting too often. 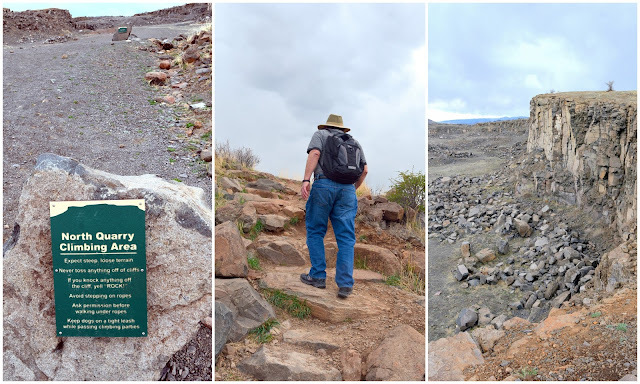 Stopping along the way enabled me to take some photos of the volcanic rock formations and to look for nesting raptors. The south portion of the mesa had particularly prominent cliffs. ...and then a look back at where we climbed from the bottom when we reached the top! I made it and was happy to finally be on flat ground again. Unfortunately, clouds were quickly gathering and we could see the weather was going to change, but we hoped to see as much as we could on the summit before that happened. It was exciting to be on the top of a mesa and the shear size of it became apparent right away. We saw trail markers and had to decide which way we would hike. 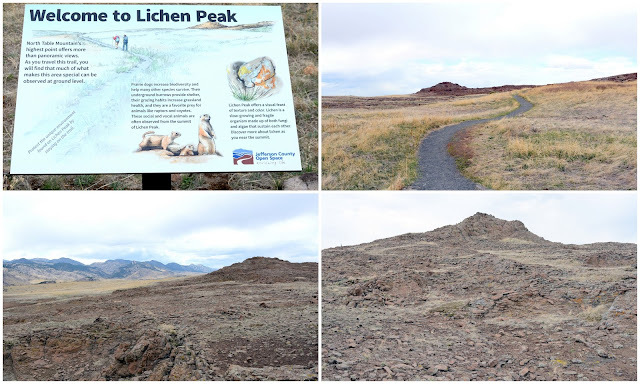 We decided to hike the Lichen Peak Trail, a narrow "hikers only" trail that traverses through "Lichen Peak Garden," which is a hardscrabble area composed of many basalt rock covered with various forms and colors of lichen. Lichen are formed by a symbiotic relationship between single cell algae and fungus. The end of Lichen Peak Trail is the highest point on the mesa, at 6,575 feet (2004 m), and offers a panoramic view. Please click on to enlarge. Lichen can survive in some of the most barren and severe regions on earth, but they are also susceptible to destruction if trampled on, so we stayed on the trail to admire it. 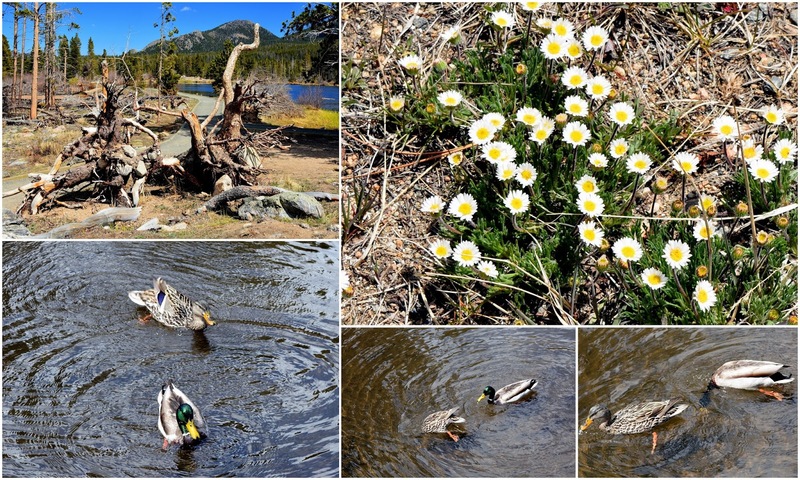 We were surprised to see some early wildflowers blooming in April, when we made this walk. 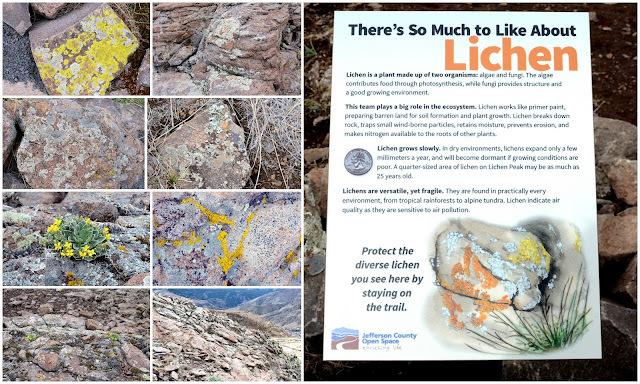 There was a fascinating array of different colors of lichen growing on these rocks! Lichen grows at the slow rate of 1mm. per year, so a quarter size patch could be as much as 25 years old. The views from the end of the Lichen Trail, which ends in a slight promontory, are amazing! this is the view south. Facing east we could see the city of Denver, resting a mile high on the distant plains. .... and facing north we saw antenna towers dotting the mesa top. Look closely under the lone tree, by clicking on the photo to enlarge it, to see deer resting in the grasses. We walked back along the Lichen Trail to return towards the North Quarry climbing area . We walked up the stone steps to the top of the North Quarry part of the mesa. Looking back from this point one can look down on the trail that leads up from the parking lot at the bottom, and it gives a good perspective of the steepness of the climb. Another view looking down at the gorge. We reached the end of this part of the mesa, and I could look down on some of the town of Golden. Notice the "M" near the top of distant Mount Zion? That is a symbol for the Colorado School of Mines University--a highly rated engineering university located in Golden. I blogged about their Geological Museum on this post. ...and in a fine mist we walked back down North Table Mountain. Driving away towards home, I took one last look back and one last photo--amazed that I could finally say that I made it to the top of North Table Mountain! I might never have the chance or ability to walk up a 14er, as the natives call Colorado's fifty eight 14,000 plus foot mountain peaks, but any challenge is a good one, don't you think? I know I'll return to hike more of North Table Mountain one day in the future. When I learned last week on the Rocky Mountain National Park Facebook page that Trail Ridge Road, the highest continuous road in the United States, was plowed open to Rainbow Curve at over 10,000 feet, my husband and I decided to take an impromptu car ride to see how the park looks during spring! Rocky Mountain National Park is open 365 days of the year, 24 hours a day, but there are many road closures inside the park during winter due to snow. We choose to drive on the Peak to Peak Scenic Highway to reach the park. 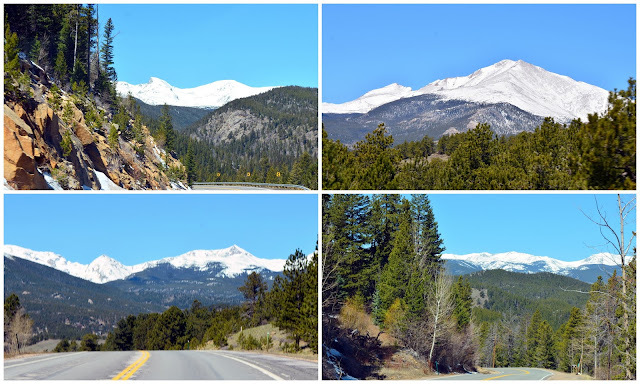 This scenic highway was established in 1918 and is Colorado's oldest scenic highway. It provides magnificent views of the Continental Divide, national forests, wilderness, and nature preserves. I blogged about it before and you can see a map of the areas and towns it passes through there on this post. On this trip the high mountain peaks were covered with brilliant white snow and each turn and bend in the highway lead to spectacular views. Almost as soon as we entered the park we came upon this herd of very hungry elk grazing in one of the meadows. As you can see from the photos above, they are in the process of shedding their heavy winter fur coats as the temperatures rises. The males have not yet grown their new antlers for the season. All of these photos were taken from a safe distance. It is tempting to want to get close, but they are large wild animals and unpredictable, so its best to be cautious and allow them peace to go about replenishing the calories they need. Rocky Mountain National Park encompasses 415 square miles and protects spectacular mountain environments and wilderness. One of the first views one gets in the park is of the 14,259 foot (4346 m) Longs Peak, which is always a thrill. The peak is named for Major Stephen Long who is said to have been the first to spot the mountain on an exploration in behalf of the US Government on June 30, 1820. ...and stopped at a parking area at the Many Parks Curve to gaze down to one of the panoramic views. In the early 1800's French speaking trappers called the broad mountain meadows "parques," and the name remained. Here we can see parts of Estes Park, Horseshoe Park, Moraine Park, Little Tuxedo Park and Beaver Meadows. At over 9,640 foot (2633.4 m) elevation, Many Parks Curve also gives one another dramatic view of Longs Peak. .....and we came upon the sight of a snow plow, ready to remove any new snowfall. Although it was a bright blue sky day in the high 60's at lower elevation, the temperature gets cooler as one climbs higher, and the weather can change quickly. We soon see a road closure sign ahead and we know we are approaching Rainbow Curve and the last portion of Trail Ridge Road that has been opened by plows so far this spring. At 10,829 feet (3300.6 m) at the Rainbow Curve parking area the road was officialyl closed going up to higher elevations. Trail Ridge Road is 48 miles long in total, 11 of those miles are above the treeline and 12,183 feet ( 3713.3 m) elevation at the Alpine Center. One of the powerful John Deere snow plows that are plowing the road past the closed portion. Another plow heads west to east until the entire Trail Ridge Road is plowed completely open. Usually the road is officially opened around late May, weather permitting. A recorded telephone message line that gives up-to-date Trail Ridge road conditions is 970-586-1222. There are more gorgeous views from Rainbow Curve of both Horseshoe Park and 13,425 (4091.9 m) foot high Mummy Mountain. 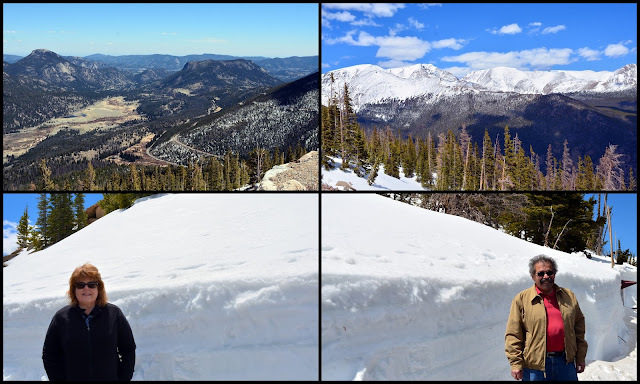 Both my husband and I were amazed to see the snow was over our heads, even though the temperature at this point on the day of our visit was 54 degrees and the snow was melting fast. We decided to walk along the closed road for awhile. It was uphill all the way! Just the tip of this road sign was showing in the snow. It's easy to see how the Rocky Mountains got their name from Native Americans! There has been constant erosion going on since they were formed 170 to 40 million years ago. We returned to our car, turned around, and went back down Trail Ridge Road to lower elevation and turned onto Bear Lake Road towards Sprague Lake. 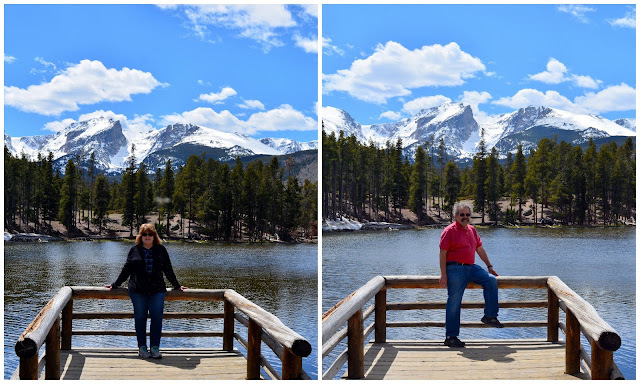 The elevation at Sprague Lake is 8,690 (2,648.7 m) feet and at this lower elevation the snow has almost all melted. There is a trail that circles the entire lake that is about 09. of a mile long and has beautiful views. We love taking photos here! The park was blissfully very quiet on the day we visited, with much less crowds than when we visited in summer and autumn. In 2016 Rocky Mountain National Park broke attendance records with 4.5 million visitors! 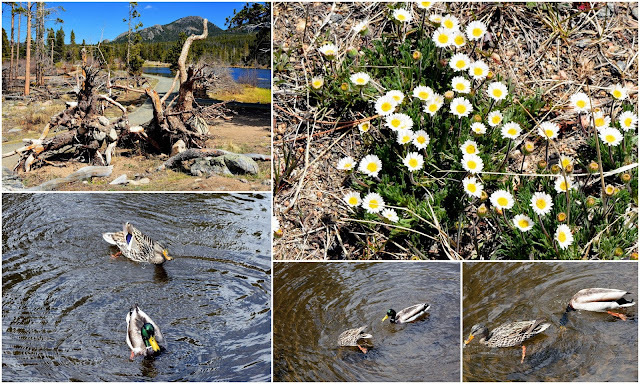 I saw the first wildflowers growing along the lake trail and a duck couple happily taking turns diving underwater for food. There was also signs of winter storm damage and dead fall trees. I read recently that all the national parks are in need for more funding for maintenance, and I sincerely hope our government allows that to happen, as the parks provide jobs and a boost to local economy. We traveled on by car to park at Bear Lake, which is at a higher elevation at 9,475 feet (2889.9 m). 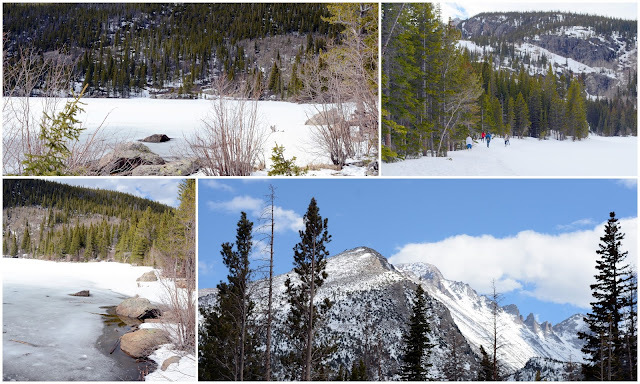 It is surrounded by tall mountains and pine trees, so the lake was almost all frozen and the trail that circumferences it was full of snow pack. Since we were not wearing boots we only hiked a short distance around the lake, just enough to get a view of Longs Peak again. We then traveled back and parked at the Bierstadt Lake trail head, which is at 8840 feet elevation (2694.4 m). The trail begins through lodgepole pines and aspens and climbs more than 600 feet along a series of switchbacks. 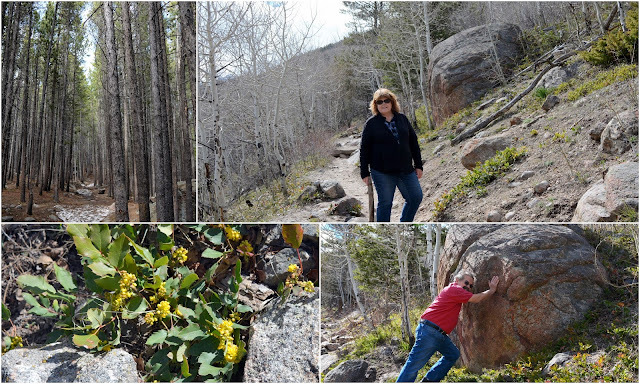 I saw more wildflowers at the beginning of the trail and my husband and I had fun pretending he was Sisyphus rolling a boulder uphill. As the trail climbs higher spectacular views of the mountains along the Continental Divide begin to open up. The clouds were also building up as the day progressed into late afternoon.Almost two thirds of the mile hike up two people coming down the trail told us that conditions were snowy and icy at the top and that they turned back. We decided to do the same and returned back to our car and decided to end our visit to Rocky Mountain National Park. We really enjoyed seeing it in its quiet spring season and snow capped beauty. We saw more elk grazing in a field when we entered the town of Estes Park. We felt as hungry as they were after our long park adventure, so we stopped in town and had a delicious dinner at a local barbecue restaurant. We took a different route back home, on Colorado 36, driving through a canyon, passing serene valleys and along the front range. It was the end of a perfect day!